It’s becoming increasingly apparent, even among previous skeptics, that religions and whole societies have oriented themselves in accordance with the heavens in ways we are are only now discovering. Astrological interpretation lies at the heart of our ancient civilizations’ telling us where we came from and where we are going. The integrity of these traditions is extraordinary. 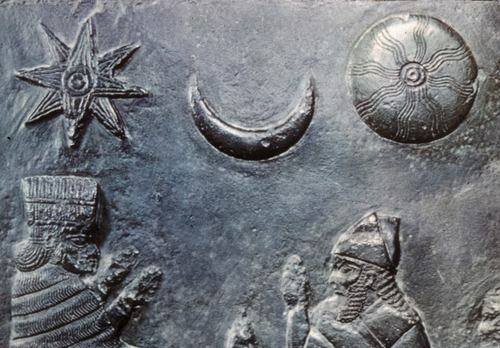 This begins a series of articles in which I will examine the history mythology and astronomy underlying the culture of our forbears, from paleolithic cave paintings to the current era. Various species of wild bulls were found throughout Europe, the Near East, Central Asia, North Africa and bull Sumer. 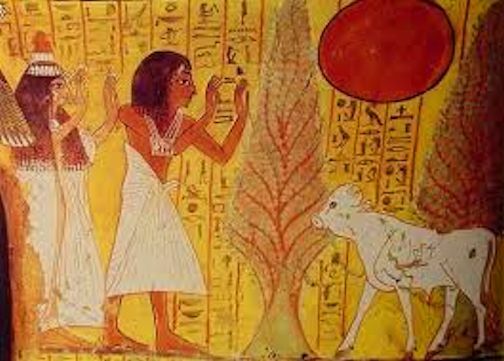 In fact the progenitors of the cow had pastured on the plains and grasslands of central Mesopotamia since ancient times. Of course, there is huge gulf between wild animals and their domestication. The Age of Taurus saw the beginnings of agriculture on a hitherto unknown scale by harnessing the power of the bull. The wild bull was a massive creature, standing over 180 cm at the shoulder. Whenever reference in writings or visual art, the bull was venerated as an embodiment of supernatural strength, virility and ferocity, The constellation Taurus was rising at the Vernal Equinox approximately 4300 BC and 2150 BC. King Gilgamesh is thought to have reigned at some time between 2800 and 2500 BC. This falls within the Age of Taurus, the bull of heaven. The significance of the Bull if Heaven is enormous and existed in multiple layers of meaning, across an extraordinary number of cultures and reaches back at least as far in time as the Paleolithic period. Taurus is a large and prominent constellation in the northern hemisphere’s winter sky. It is one of the oldest described constellations, dating back to at least the Early Bronze Age when it marked the location of the Sun during the spring equinox. The image at the top of the page shows the Sun rising in the East, in the constellation Taurus, represented by the white calf. The Bull became leader of the signs, rising with the Sun at the Spring Equinox, from approximately 4300 to 1580 BC, Taurus came to symbolize the bull in the mythologies of Ancient Babylon, Egypt, India, Minos, and Greece. The “sacred cows” and bovine deities became virtually ubiquitous. The essential significance of the Bull is found not only in the Torah via the Golden Calf and other references but in the Hebrew language itself. It is the first letter in the Hebrew alphabet, almost certainly adopted from the Phoenicians and gives us the word alphabet when combined with the second letter of the Greek alphabet, Beta. 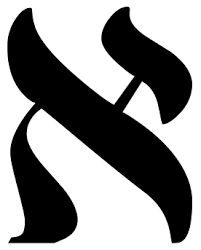 Aleph means Ox. 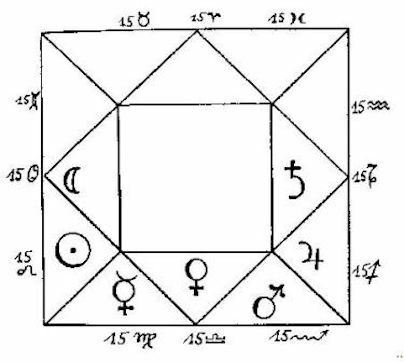 In literal terms, of course, this would refer to a castrated bull, but the deeper significance is the harnessing of a very powerful energy which can then be used in a directed way. With the domestication of bulls and cows, agricultural tasks, hitherto all but impossible, such as plowing the soil, creating a new agricultural society, massively increasing the ability to produce food for burgeoning populations. . It was a pivotal moment in the history of civilizations. What is above is below. 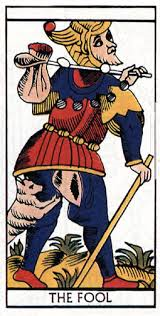 Those familiar with the Tarot will know that The Fool card is Aleph. The portrayal differs from one deck to another, but the core images are virtually universal. The Fool is the beginning and also zero. He is perfect potentiality, goaded by a dog (presumably representing animal natural ) What he is carrying over his shoulder is metaphorically phallic and seminal – what we call potency. It will remain as potentiality until the energy finds the ways and means to be realized. There are two stories which are immediately germane to the nature of Venus and Taurus. She gets her way and unleashes Gugalanna who becomes an epic version of the bull in a china shop. The Bull is subsequently slain by Gligamesh Unwilling to die, the bull ascended to the stars to claim the constellation Taurus. This might seem a great contradiction, but many ancient cultures believed that at least some of its population would become stars. This is also the beginning of another connected theme : Inanna’s descent into the Underworld. Her clothing is removed as she enters the underworld, This is a ritual in which she is symbolically stripped of all her powers and is turned into a corpse. Enlil and Nanna will not help, claiming that she brought this fate upon herself – suggesting she wanted to usurp her sister’s power. However, Enki agrees to bring her back to life, sending Kurgarru and Kalaturru to revive her with nourishment and the water of life. Inanna is in fact resuscitated but she is to leave a sacrificial substitute in her place. It is not a difficult decision. Her husband Dumuzi is chosen because he hadn’t mourned her absence as much as he ought to have, In an interestingly Venusian detail, she rejects the idea of her hairdresser taking his place. The descent into the Underworld is referring to the period of Venus being invisible – below. When she reappears she does so as the Morning star she Lucifer, the Bringer of Light. 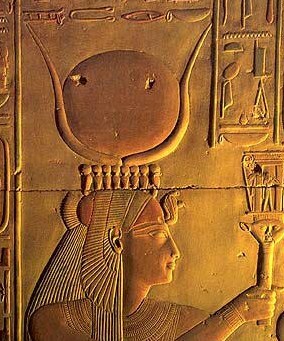 She is therefore ahead of the Sun and the cycle will repeat itself. 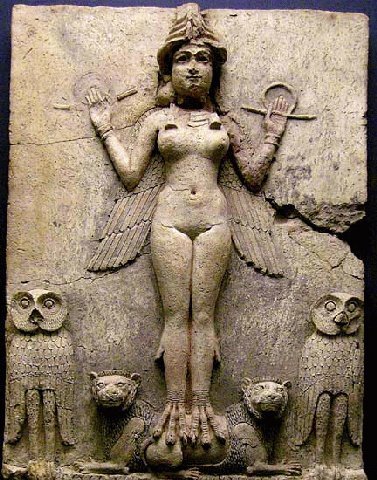 As I have mentioned elsewhere, the Venus cycle corresponds to the gestation period and underscores her role as bringer of life.n Babylonian tradition she was a “star” in a trinity with the Moon and Sun. She was at one time personified as the Great Goddess who gave birth to the Sun, and at other times known as Lucifer, the light. This entry was posted in Archetype, Traditional Astrology and tagged Inanna, Sumer, Taurus, Venus. Amazing! Congratulations for the article, Peter!